62 THE SHOP JANUARY 2019 Octane Improver VP Racing Fuels, San Antonio, presents its new Octanium Unleaded octane improver. Designed to increase octane up to seven numbers and improve throttle response and acceleration, Octanium Unleaded cleans fuel injectors, eliminates gum and varnish build-up, and acts as a lead substitute. One bottle treats up to 10 gallons of gasoline, increasing octane by up to 70 points. Cadillac CTS-V Supercharger Upgrade Magnuson Superchargers, Ventura, California, presents its TVS2300 Heartbeat tuner kit upgrade, now available for 2016-up Cadillac CTS-V LT4 applications. The kit comes with everything necessary to swap the factory LT4 R1740 supercharger with the larger, higher-performance Magnuson TVS2300. The Eaton-based R2300 rotors are 32-percent larger than the stock R1740 for 30-plus-percent power gains at high engine speeds. The TVS2300 Heartbeat is a fully integrated supercharger/ intake manifold/intercooler system that fits under the stock hood. EcoBoost Mustang Turbo Precision Turbo & Engine, Hebron, Indiana, presents the PTE/Turbonetics EcoBoost Ford Mustang Performance Upgrade Turbocharger. Designed to be a direct drop-in replacement and install without modifications, the turbocharger utilizes high-efficiency CEA compressor and turbine wheels for additional horsepower, better response and less lag. All units come equipped with a dual ceramic ball bearing Center Housing Rotating Assembly (CHRA) for durability, divided twin scroll turbine housing and a ported shroud compressor housing. Big-Block Chevy Marine Cylinder Heads Air Flow Research (AFR), Valencia, California, offers its complete line of big-block Chevrolet Marine Cylinder Heads. The cylinder head assemblies come complete with Inconel exhaust valves, hydraulic roller springs and hard-coat anodizing. Bare unassembled cylinder heads will be hard-coat anodized only. 2018 Jeep Supercharger Kits ProCharger, Lenexa, Kansas, presents its Supercharger kits for 2018 Jeep JL applications that offer up to 50-percent horsepower gains. The tuner kits include large air-to-air intercoolers to keep air inlet temperatures low even under extreme conditions and are designed for easy installation. The ProCharger belt drive system allows the belt to be removed or swapped without removing other components, and the supercharger head unit mounts as high as possible to leave more room for aftermarket suspension/steering parts. 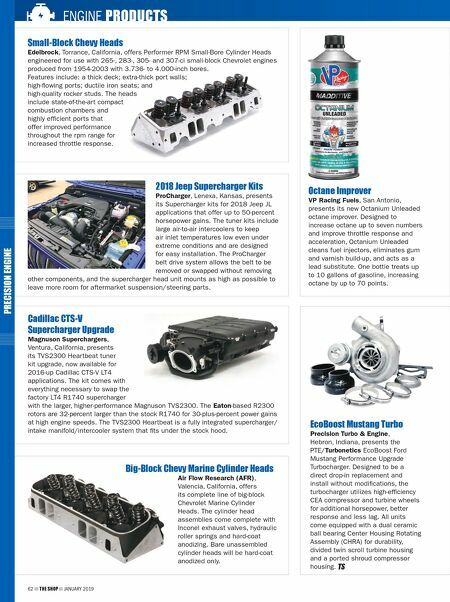 ENGINE PRODUCTS PRECISION ENGINE Small-Block Chevy Heads Edelbrock, Torrance, California, offers Performer RPM Small-Bore Cylinder Heads engineered for use with 265-, 283-, 305- and 307-ci small-block Chevrolet engines produced from 1954-2003 with 3.736- to 4.000-inch bores. Features include: a thick deck; extra-thick port walls; high-flowing ports; ductile iron seats; and high-quality rocker studs. The heads include state-of-the-art compact combustion chambers and highly efficient ports that offer improved performance throughout the rpm range for increased throttle response.